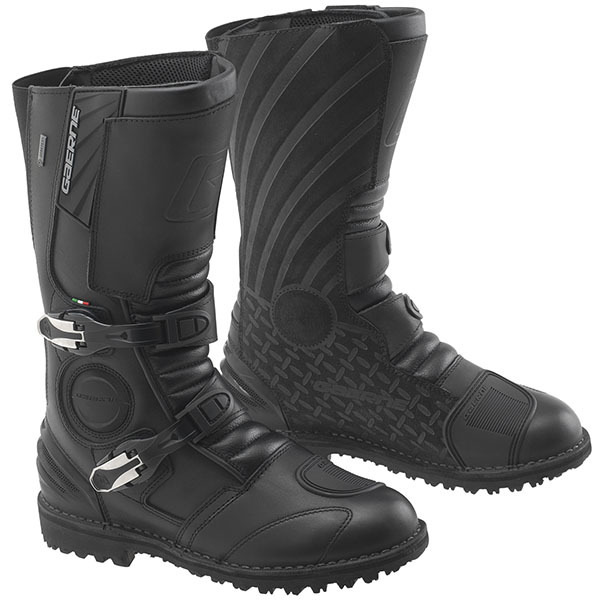 I chose these as the leather is noticeably thicker makes the new boots quite stiff. The adventure styling goes about as far as triumph did with the tiger, so a good style match. Although stiff the boot fits well and has level 2 protection. I’m now walking around the house in my new boots to start the process of wearing the boots in. I’ll post some more comments when I start riding in them. first rain test completed. I did 100 miles in heavy and persistent rain on Sunday and I am happy that my feet were warm and dry. can't go wrong with Gaerne and Sidi. Oh wow. Now that's a shame. I had two Gaerne boots in my lifetime. Wore each of them over 30,000 miles in every weather condition you can imagine... never had any trouble with'em - I literally wore them out. Used Goop to glue the heels back on and used ski boot waterproofing on the leather. For touring and rainy days tho I've bought a pair of Daytona GTX that are fantastic. You're safe with Goretex, they are guaranteed to be water proof for the life of the product or they will replace them for you as I found out a couple of years ago when one of my 11 year old Hein Gericke boots suddenly started leaking. I contacted Goretex, sent them a few pictures to show condition of boots and in under 2 weeks I had a brand new pair of SIDI Adventures on my doorstep. Result. I had a pair of Hein Gericke boots that used their own Sheltex lining, rather than Gore-tex.